CorelCAD has evolved quite a bit over the years and is optimized for both Windows and MacOS platforms. It is also designed for a range of potential users including full-time AEC designers, DIYers and graphic artists who need to create and edit DWG files. CorelCAD 2019 continues the evolution. 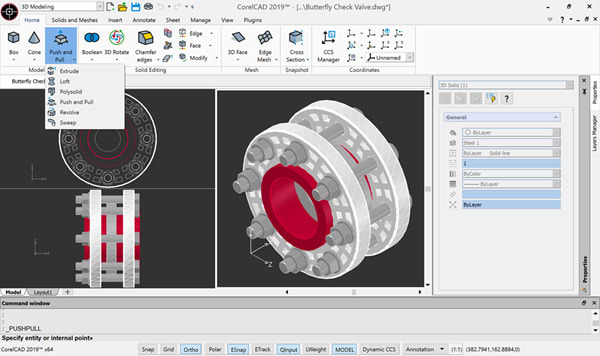 CorelCAD 2019 provides new productivity enhancements that include a redesigned layers workflow, new solid-modeling options, and drawing recovery and file-authentication features. CorelCAD 2019 also lets users leverage existing 3D models with STL file importing capabilities. After bringing STL files that are compatible with 3D-printing machines into CorelCAD 2019, they can insert 3D objects contained in those files into a design for modification. “The new Push and Pull feature is a leap forward in intuitive 3D design and editing, while workflow improvements make it possible to take your designs from concept to completion faster,” said Klaus Vossen, Corel senior product manager, Technical Graphics. Layers: CorelCAD 2019 has features to keep layers in order, control the appearance of design components in drawings and preview layer contents. The new MergeLayer command lets you merge layers to a destination layer and delete redundant merged layers from a drawing. The Layer States Manager is a hub for saving, restoring and managing configurations of layer properties and layer states, which are snapshots of current settings. You can also edit Layer properties or save them so they can be shared across projects. Solid Modeling: The new PolySolid command lets you draw 3D solids in the shape of polygonal walls. A 2D shape, such as an arc or line, can now be extruded into the surface of a 3D model with the Push and Pull command. The new ChamferEdges command simplifies the creation of recessed edges on a range of design components, from concrete formwork to roofing. The Helix tool can give any object a 3D shape in a single layer around a cylindrical shape. It lets you use 2D spirals and 3D helixes as paths to create threads, springs and spiral stairs. You can add 3D solid primitives to your design and use Boolean operations to unite, intersect and subtract bodies. 2D entities can be extruded, revolved or swept along a path. You can also loft between 2D entities to create solid objects. CorelCAD 2019 can also slice and intersect solids and edit edges, faces and bodies of 3D solids. Drawing Recovery: If you experience a crash due to a hardware issue, power failure or software problem, the new Drawing Recovery Manager palette (launched with the DrawingRecovery command) displays the autosave and backup files available for each drawing that was open when the system unexpectedly shut down. It also lists details about each file, as well as a preview. From there, you can open or delete any of the drawings. File Authentication: When you’re working on collaborative projects, CorelCAD 2019 provides new authentication commands. It associates a file with a digital signature, a block of encrypted information that identifies the originator, and indicates whether there have been any modifications since it was signed. DWG Support: You can open and edit AutoCAD 2018. DWG files, including ones created using subscription versions of AutoCAD. CorelCAD 2019 also saves to AutoCAD 2018. DWG natively. Many CAD tools and their proprietary file formats contain elements that aren’t supported in .DWG. Conversely, AutoCAD has features that aren’t supported by some applications, which can cause unwanted surprises during file conversion. With CorelCAD 2019 and its ability to process the file attributes of non-supported AutoCAD features, there is full compatibility when collaborating with partners and customers who work with the .DWG file format. CorelCAD 2019 is available now and pricing is $699 for the full version and $199 for the upgrade. CorelCAD 2019 is also offered via subscription from the Mac App Store and Microsoft Store for Windows 10. Monthly subscriptions are priced at $34.99, and an annual subscription is available for the equivalent of $300 per year. For more information, visit CorelCAD’s website.